Stephen Denys is director of business management for Maizex Seeds and a long-time member of the Canadian Seed Trade Association (CSTA). He's been following the issue of pollinator health closely since the debate over honeybee losses and their connection to the use of neonicotinoids flared up five years ago. Pollinator protection has been a hot-button issue in Canada for the last five years. We look at some of the efforts in this country to protect pollinators and what the implications of them could be for the seed sector. Recent headlines regarding overwintering of honeybees in Canada and the rest of North America over the past decade have often not been good. Annual honeybee colony losses have averaged 25.03 per cent in Canada since 2007, while the rate in the U.S. was slightly higher at 28.4 per cent. That’s why a recent report out of the U.S. was welcomed as good news by members of the agricultural sectors and scientific communities on both sides of the border. In May 2017, the Bee Informed Partnership (BIP), in collaboration with the Apiary Inspectors of America (AIA) and the U.S. Department of Agriculture (USDA), announced 21.1 per cent of managed colonies in the U.S. were lost over the winter of 2016-17. That number represents an improvement of 5.8 per cent over the previous winter and is well below the nation’s average during the past decade. There is reason for optimism north of the border. According to the Canadian Association of Professional Apiculturists (CAPA), the number of overwintering colony losses in Canada the past two years was well below the national average for the past decade (16.8 per cent in 2015-16 and 16.4 per cent in 2014-15). “I think the fact the overwintering losses continue to decline shows that the cooperative working practices that have been emphasized the last few years are working, that beekeepers are stepping up their management on managing health-related issues with bees and growers are starting to modify their practices, understanding they have to use agronomic practices that help ensure a healthy environment for pollinators as well,” says Calgary-based Paul Thiel, vice-president of product development and regulatory science for the Crop Science Division of Bayer in Canada. Several efforts are currently underway in this country to help protect honeybees and other pollinators such as bumblebees, and butterflies. 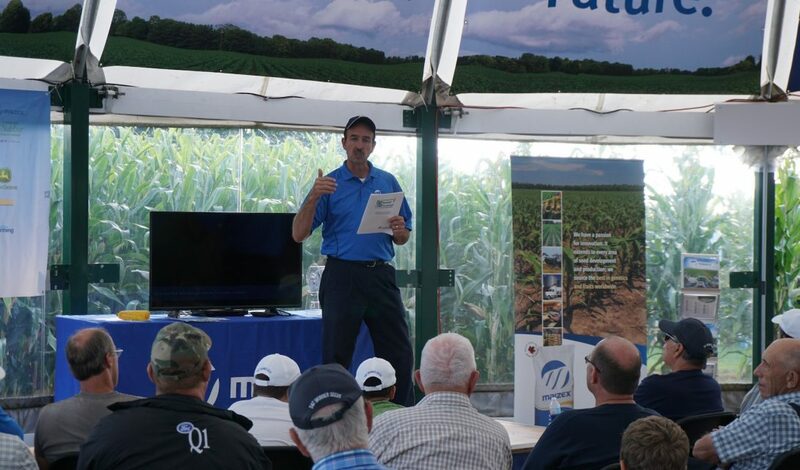 Stephen Denys is director of business management for Maizex Seeds and a long-time member of the Canadian Seed Trade Association (CSTA). He’s been following the issue of pollinator health closely since the debate over honeybee losses and their connection to the use of neonicotinoids flared up five years ago. Denys says he’s been encouraged by the efforts made by the ag industry, government and other groups to promote pollinator health and protect natural habitats. Even more encouraging, he says, is the fact that the debate over treatment methods appears to be shifting away from being emotion-driven to science-based. “The concern from the seed industry is that we’ve been successful at agriculture on this continent and in Western civilization because we’ve always taken a scientific approach to things,” says Denys, a former president of the CSTA. Bayer has teamed up with several industry partners and organizations as part of the Bees Matter initiative. The outreach program aims to share information on honeybee health in Canada with the Canadian public and raise awareness with everyone from agricultural producers to backyard gardeners about practices they can adopt to ensure pollinator health. Bayer is also part of a bee health roundtable group spearheaded by Agriculture and Agri-Food Canada that has been tasked with identifying and addressing risks and opportunities related to bee health. One of the projects the company is involved with that will be of interest to the seed sector is the creation of a new fluency agent for negative pressure air seeders. In the past, a mixture of talc and graphite was used to expedite the movement of corn and other seed as it was vacuumed through the seeder. The wax-based fluency agent means there is far less dust created when treated seed exits the seeder. Bayer is also working on a new miticide designed to help beekeepers control the Varroa mite, which has been referred to as the vampire of the honeybee industry. There are currently few ways to control the deadly parasite, which originated in Asia. Research has indicated the strips can control as much as 95 per cent of mites. “It will give a rotational option to beekeepers so they are not as reliant on too few compounds and help to reduce the potential for resistance development in the Varroa mite population,” Thiel says. While pollinators have been making plenty of news, knowledge of their habits and habitats here in Canada remains lacking. Nigel Raine, a pollinator expert at the University of Guelph and Rebanks family chair in pollinator conservation, is seeking to change that. Raine is leading a team of researchers that will be monitoring pollinator activity at 50 different locations throughout the province of Ontario as part of a multi-year study that began in 2016. It’s believed to be the first time a study of this kind has been conducted on such a large scale anywhere in Canada. “What we’re hoping to get is a broader picture of the distribution of wild pollinator species and how they’re related to different habitat types and different land use categories. We’re trying to include everything from provincial parks and conservation areas through to intensive agriculture and even some urban sites,” Raine says. One of the biggest challenges with the study, according to Raine, is the large number of different pollinators that call Canada home. There are more than 850 species of bees in this country, with most of them being solitary ground-dwellers. Raine says the study has potential implications for the agriculture industry in not only Ontario but the rest of the country, since three-quarters of the leading food crops are pollinated by some form of animal. The data from the study could eventually help determine where pollinator habitats need to be located and how widely they should be distributed. As for the seed sector, Raine says the study could lead to more integration with industry in terms of how plants, particularly native plants, are sourced to create the mixes for habitats that will support pollinators and wildlife in general. It could also increase demand for seed required to produce pollinator-friendly habitats in some cases, he adds. Pollinator Partnership Canada (PPC) is a registered non-profit that does mission-based work across the country aimed at promoting and protecting pollinators and their ecosystems. It’s comprised of more than 140 stakeholder organizations including university faculty and researchers, farmers, corporate agriculture, seed producers and corporations with an environmental ethics platform. It’s one of the partners behind the Million Pollinator Garden Challenge, a campaign to register one million public and private spaces as pollinator habitats. It’s also created a series of 15 regional guides designed to help gardeners, farmers and land managers select plants for pollinator-friendly habitats. The partnership has also been one of the driving forces behind the creation of a series of so-called bee hotels across the country. The project was started in 2014 in conjunction with the Fairmont hotel chain to build sustainable resting places, or ‘hotels’, for solitary bees. PPC research director Vicki Wojcik says it’s difficult to qualify the impact the hotels are having on bee populations. However, she says the project has had a huge impact in terms of raising awareness regarding the importance of pollinator health. “We often have more of an opportunity to get people interested in the concept within a more urbanized context. Eventually, over time, the idea does take hold,” she says. The partnership has also teamed with Bayer and the University of Guelph to look at how cover crops can be used to enhance pollinator nutrition. “What this research study is trying to see is what kind of plant-pollinator interaction we see with cover crops so that we can give farmers more tools,” Wojcik says.